Have you been following along this past week with all the wonderful creations made with Taylor's newest sets?! Aren't they amazing?! You can now get them for yourself at Taylored Expressions. I just adore this sentiment and I couldn't wait to use it. This is a little pizza box, which Jen del Muro wrote a tutorial for and you can find it here on SCS. It's super easy and very well written. It was perfect for some strawberry filled chocolates I picked up for a colleague at work. AWESOME, Dawn!! I love your piercing IN the scallops...GOTTA try that! Great job with all the KI patterns and colors, and I love that the pizza box is blue. So sweet! sweet, Dawn! Love the colours, love the shape, everything! 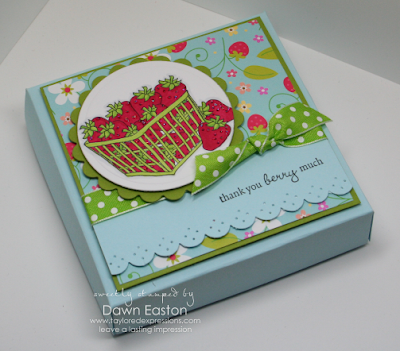 SOO sweet Dawn - love the pizza box for strawberry filled chocolates! Adorable and perfect! Your strawberries look wonderful, and I love your pizza box!! Such pretty colors and papers!! LOVE this Dawn! What a super sweet project and the piercing in the scallops...sigh...I LOVE that! !